I'm creating a circuit with an infrared led and a transistor connected to a gpio pin. I'm currently using 5v with a 40 ohm resistor (four 10 ohm resistors chained) but I'm not sure what resistor to put on the transistor. The only transistor I have is the PN2222, will that work, and what resistor should I use? There's not quite enough information in your question to give a definitive answer, but let's go through the design steps so that not only can you figure out this one, but you might be better equipped to solve the next transistor question that occurs to you. simulate this circuit – Schematic created using CircuitLab Note that I've shown your four 10 ohm resistors as a single 40 ohm resistor for clarity. In this circuit, the forward voltage is around 1.6V (which is under the the maximum VF of 1.7V per the datasheet) and the current is around 85mA. If you're using a different IR diode, you'll have to find and look up its datasheet to get the specifics for your part. Yes, that's a rhetorical question. There are many ways to think about transistors, though. One useful way is to think of them as current amplifiers. The gain of a transistor, specified as hFE is roughly the ratio between the collector current IC and the base current IB. This a very simplistic way of thinking about it, but it's actually still useful in practice. That is IB * hFE = IC (approximately). The actual value of hFE varies, but a typical value is 100 or more. The next thing to remember is IB + IC = IE; all of the current flows through the emitter. That's split between the base (tiny) and collector (most of the current). 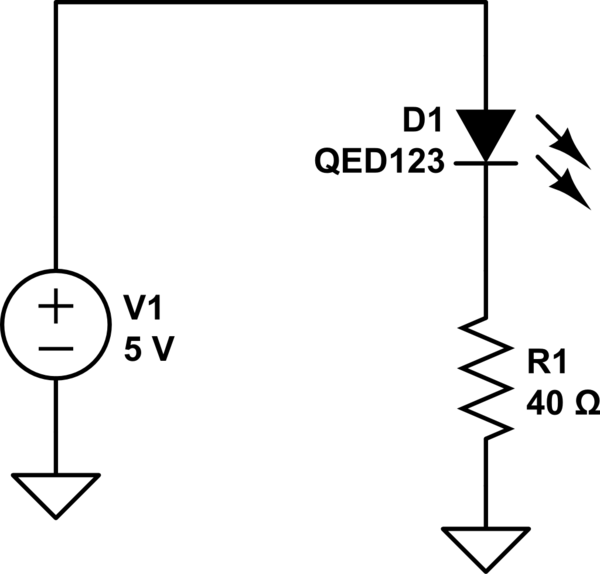 Direction of the current depends on whether the transistor is PNP or NPN. 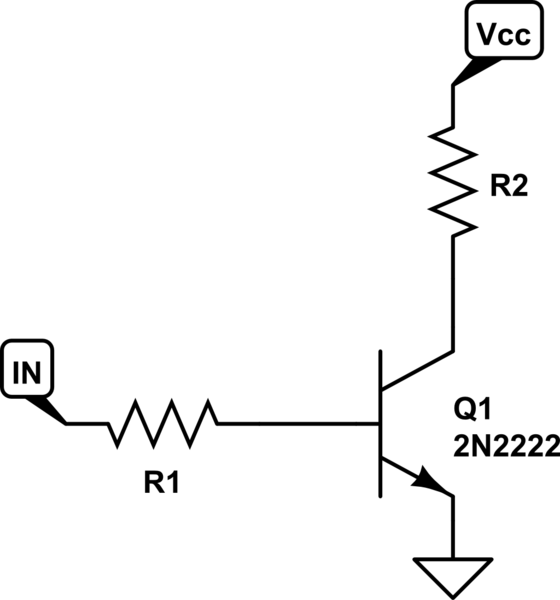 A 2N2222 is an NPN transistor, which is also the more common kind of bipolar transistor, so the rest of the discussion will assume NPN. Everything's mostly the same for a PNP transistor except that the currents and voltages are reversed with respect to an NPN transistor. The resistor R2 represents the load. In your case the load is the IR diode, and whatever current limiting resistor might be needed. We can calculate that first. The voltage and current for the IR diode, as mentioned above, we can get from the datasheet. The datasheet says that the maximum continuous current is 100mA (your datasheet may specify some other number). So we can start with that. We could either use a 3.3V Vcc or a 5V Vcc. Let's say 5V. The voltage across the diode will be less than 1.7V according to the datasheet, so 5V - 1.7V = 3.3V. Next we look at the datasheet for a 2N2222 transistor and look up the at the VCE(sat) which means the voltage from the collector to the emitter when the transistor is in saturation (fully on). That is 0.3V at IC=150mA according to the datasheet which is close enough to our target of 100mA to use. So 3.3V - 0.3V = 3.0V. So now 3.0V/100mA = 30 ohms. You could use three of your 10 ohm resistors or a single 33 ohm resistor (which is the nearest standard value). However, I'd recommend increasing that a bit so that the IR diode isn't operating at its absolute limit. We can step up to the next standard value which is 39 ohms. Given that we have determined the collector current (around 100mA), we can calculate a minimum base current by using the transistor's hFE, if that's the only figure we have. So 100mA / 100 = 1mA. However, the value of hFE isn't really that useful when trying to drive the transistor into saturation. That's because hFE is only meaningful in the linear range of the device in which more base current translates into proportionally more collector current. Because we want to drive the transistor into saturation, which is a region in which more base current does NOT result in more collector current (because it's saturated), we have to add in a factor to make sure it's driven all the way to saturation. We can arbitrarily choose a value of 5 to 10 or so for that. So a 10x multiplier would give us 10mA in. The GPIO of the Pi is capable of delivering that, but let's do the calculation a different way instead. We see that the input current is about 15mA, as calculated and the diode current is 83.48 mA (comfortably less than the maximum 100mA). The diode voltage drop is 1.656 V which is close to but less than the maximum 1.7V. For some additional safety margin, you could further increase the value of current-limiting resistor R2. Note too, that this is close to the maximum specified current for the Pi, so you will have to program the particular port for that much current (current is specified from 2mA to 16mA). The calculation of resistor values is a multistep process that uses data from datasheets for both the load and the transistor being used. It only requires some simple mathematics that can easily be done by hand. I hope that this answer not only answers your specific question but can also be employed by others wishing to do their own designs. I assume that the LED is a 100mA type? And from the PN2222 data sheet we assume the gain of the transistor is 100 or so. This means the transistor current will need to be arround 1mA, and the GPIO voltage is 3.3v. Using Ohms law, 3.3/0.001 = 3k3, or if you take into account the bias voltage, (3.3-0.6)/0.001 2700 ohms, and this would be my choice. 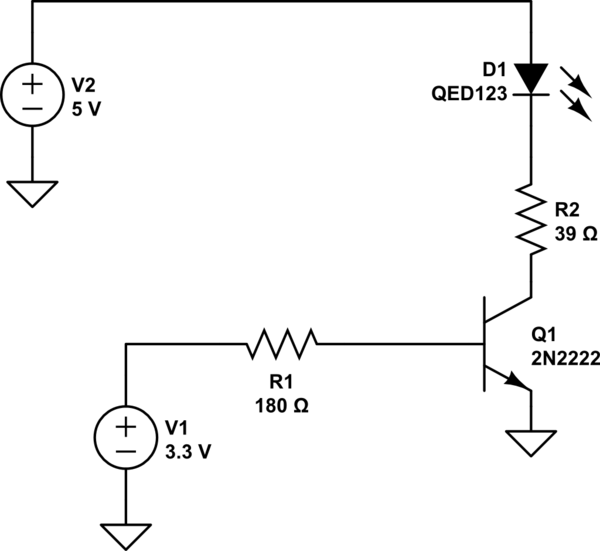 Current required / transistor gain = base current. However if I was to start with a clean sheet, I'd look at using a MOSFET device. Find the data sheet for the transistor and it should have some info there on voltage regulation. Not the answer you're looking for? Browse other questions tagged electronics voltage or ask your own question. 3V3 enough for a 5V relay?